These jangly, melodic tunes echo the essence of such hallowed power-pop combos as Big Star, Badfinger and the Flamin’ Groovies. 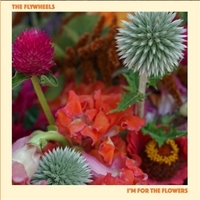 To steal a line from legendary San Francisco drive-time DJ Don Sherwood, you are about to be indoctinated into the ranks of The Flywheels -- America's slowest-rising indie-rock combo and one of its very best, make no mistake! The 12 tracks have been nurtured like fine wine by the two founding members of the San Francisco Bay Area-based combo: Kim Wonderley and Eric Scott. Lead guitarist John Moremen and drummer Gabriel Coan have joined the party more recently. The jangly, melodic tunes of the Flywheels echo the essence of such hallowed power-pop combos as Big Star, Badfinger and the Flamin’ Groovies. Wonderley, Scott and Moremen were among the members of JImmy Silva’s final Goats line-up before the great man stumbled into rock and roll Valhalla in 1994. Kim and Eric had been among a handful of second-generation SF mods who could care less that the original British mod movement had been extinguished more than 15 years earlier. Decked out in sharp-looking threads, the pair would zip around town in Eric’s bright red Vespa scooter (with six mirrors on the handlebars) in search of a gig by the Hoovers, one of a few like-minded local combos. Just to add a variety of different herbs and spices to this bubbling stew, the Flywheels also enlisted the services of Young Fresh Fellows helmsman Scott McCaughey alongside the Rickenbacker 12-string of his R.E.M. cohort Peter Buck, the unmistakable voice of Roy Loney from the Flamin’ Groovies, the keyboards of the Hoovers’ Paul Whiting and the drums and bass of old buddies Dennis Diken and Mike Mesaros of the Smithereens. All sessions were overseen by the MVP knob-twiddling duo of Allen Clapp and Chris Von Sneidern.